It is now time to plant lettuce in the Hudson Valley. Planting lettuce is a great way to add color and beauty to spring gardens. In early April tuck some lettuce plants into your empty planters or among your emerging perennials in the spots that won’t be filled by annuals until late May. 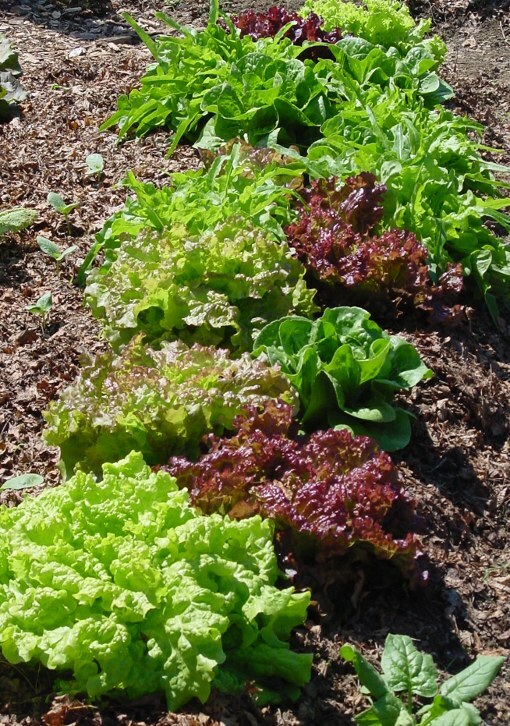 Loose leaf lettuce is the easiest to grow and provides the greatest variety of colors and shapes. Its colors range from pure lime green, to rose blush, to deep ruby reds. With leaf lettuce, the leaves of the heads do not close tightly, instead forming an open rosette. You can harvest individual leaves as needed for salads, without harvesting the whole plant. Leaf lettuces can be harvested for baby greens about 4 weeks after planting and they reach full size in 7-8 weeks. Romaine lettuce is also beautiful in the garden. Romaine leaves are thick, crisp, and juicy, so a Romaine plant is more upright than leaf lettuce. Maturity takes a bit longer, 8-9 weeks. I do not recommend iceberg lettuce for the home garden because the entire planting matures at the same time. Iceberg should not be used for baby greens. If you are starting lettuce from seed, most brands offer packets of mixed seed. For the price of a single packet you get a variety of textures, tastes, shapes, colors, and days to maturity. For the best lettuce, grow it during cool weather. Lettuce seed can sprout when the soil is as cool as 40 degrees and the plants grow best at 60-65 degrees. As long as the weather is cool, the plants will stand well in the garden, but when it gets hot the plants bolt, ie. they send up flower stalks and turn very bitter. The easiest way to grow lettuce is to start with transplants. When buying transplants, select several varieties so you have a mix of colors and maturities. I start my own transplants around March 7 using commercial ‘potting and seeding’ mix in 1.5” cell packs. Sow only a few seeds per cell as it all seems to grow, and later thin the plants, leaving only the strongest plant in each cell. In early April harden off the plants by putting them outside for short periods, gradually lengthening the time to all day. My lettuce goes into the garden the second or third week of April. Well hardened lettuce is not bothered by the frosts and freezes down to 28 degrees. Lettuce transplant protected by cardboard cutworm collar. 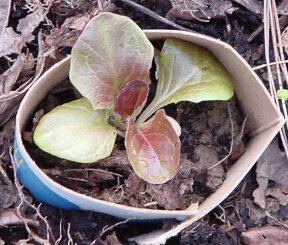 Space lettuce plants 8-10” apart.Protect plants from cutworms by using cardboard collars. I use 1.5” strips cut from cereal boxes and bent to fit around the plant. Mulch heavily between the plants; this keeps the soil cool and moist. Lettuce must also be protected from deer. Lettuce seed can also be sown directly into the garden or planter starting as early as late March. I’ve always been disappointed with my results, because there were very few seedlings. I suspect the cutworms and slugs in my garden gobbled up the young sprouts. Plan now for spring lettuce and start gardening early this year: plant lettuce for early color and salads. I wrote this article for the February 2010 issue of Dutchess Dirt.